The Quiet Achiever Award is given to someone in the community whose community work often goes unrecognised. This year we were thrilled to recognise Marie Caldwell because she loves helping other people by sharing her gift. Marie has been the pianist at Ballina Players since 1968 and as the resident Pianist, Marie has accompanied the musicals these past 50 years. Back in 1968, Ballina Players presented a musical every 2 years, then in 2003 they began to perform 2 musicals a year and from 2006 they have been presenting 3 musicals a year. Work out those numbers, then ask yourself – what does that mean for Marie? There are 3 hr. night time rehearsals twice weekly for 9 weeks, plus several all day Sunday rehearsals. On the 10th week, the final week, it is rehearsals every night of the week for the cast to polish up their performance. At last it is Opening night and it is all go. There will be 12-18 performances over the next 2-3 weeks. That is some workload! Now we might need to let you know another fact – Marie is now 85 years young. As well as this, Marie makes herself available at her home, for private lessons for any of the cast during this time. Such commitment was recognised when Marie was awarded the Platinum Palm Award at the 2015 Gold Coast Theatre Awards – for her lifetime contribution to theatre. Marie is a Life Member of Ballina Players. Marie is an Inspiration to the community. Marie had been delivering Meals on Wheels since 1968 ! 50 yrs. Marie belonged to QUOTA from 1970-1985, serving 1 year as President! 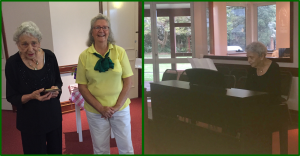 Marie plays piano for Crowley Nursing Home, RSL Nursing Home and St Andrews Retirement Village/Nursing Home at least once every fortnight since 1986 – 32 yrs. Marie is a well-loved and respected member of the community and at her age (85) does all this wonderful work on a voluntary basis because she loves helping other people by sharing her gifts. Marie was very reluctant to have a fuss made of her as she does not think that she does anything special. Everyone present thought otherwise ! We were delighted when she agreed to play some special requests for us.